One of the most enchanting parts of the entire Devon countryside is the mystical Jurassic Coast. It’s a fossil hunters dream formed about 200 million years ago. While we were pet and house sitting near Ottery St Mary, we were naturally drawn to explore this most famous coastline. The Jurassic Coast stretches almost 100 miles (150km) from near Exmouth in East Devon to Swanage in East Dorset. About 30 minutes’ drive west of our base, on the Jurassic Coast is the magnificent town of Lyme Regis. It’s a favourite summer time haunt of the Brits. Enticing south-facing beaches are protected from the weather providing the perfect playground for both kids and adults to relax. Long rows of traditional deckchairs line the promenade in summer. In the background, colourful dressing sheds and small sailboats on trailers add to the holiday atmosphere. With seagulls squawking and a gentle breeze blowing, the Sunday morning crowd fills the town. It is certainly not swimming weather, but the sun is still beating down uncharacteristically for this time of year. 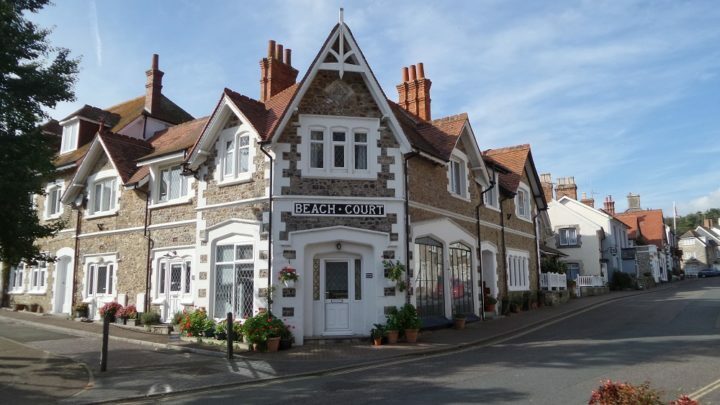 It’s easy to see why this classic English seaside village is a hit. All the restaurants and ice-cream parlours are doing a roaring trade. As an Aussie, I am naturally drawn to that British standard fare of fish and chips … along with hundreds of others! The views, the food and the almost carnival feel make this place extremely memorable. One of the most outstanding features of Lyme Regis is it’s famous Cobb wall dating back to the 13th century. The solid curved stone structure provides shelter for the harbor, which tends to be pounded by the weather at times. It allowed the town to develop as an important port on the south British coastline. It’s perhaps better known as the setting for the climactic scene in the movie French Lieutenant’s Woman where Meryl Streep’s character walks longingly along the wall. The town is worth exploring with its narrow streets, stone houses and sweeping views. There are many snaking drives along the coastline that are just as spectacular in winter as they are in the warmer months in the middle of the year. Many parts of the region are designated Areas of Outstanding Natural Beauty. There are 46 of these protected areas covering about 20 per cent of the United Kingdom. As pointed out earlier, if you are into foraging for fossils, it’s a perfect place however there are several other standout spots we visited along the coast. One of them is the town of Beer. When we discovered this on the map the name instantly drew us … Well, me at least! It proved to be well worth the visit. High white chalky cliffs framed the protected beach. Again, the beach was dressed in lines of deckchairs, dressing sheds and a variety of recreational and fishing boats pulled up on the pebble beach. A few hungry lunch goers braved the chilly wind as the brilliant blue sky tried to trick you into thinking it was summer. It’s a beautiful town. Long rows of tidy stone houses punctuate the picture postcard commercial buildings in town. The architecture is almost magical. High on the hills slightly away from the coast are cute thatched cottages overlooking the ocean. 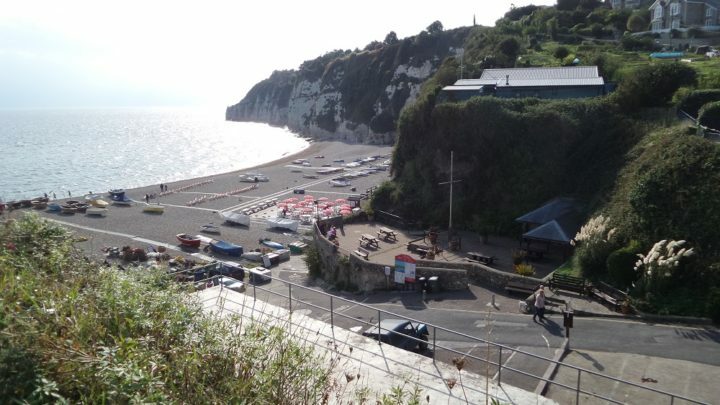 There is a lookout on one side of the white cliffs with a staircase that leads to a long view of the Jurassic Coastline. 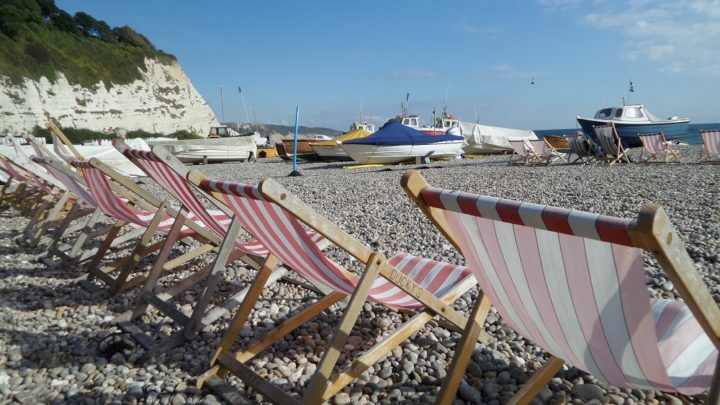 Not far to the south is another appealing little place called Branscombe Beach. More open the to weather than many others, the day we visited was semi-cyclonic. The kind of day where you almost walk sideways into the wind to stay upright. Branscombe Beach became famous in mid-2007 when a large, fully-laden container ship was beached there after being damaged in big seas. 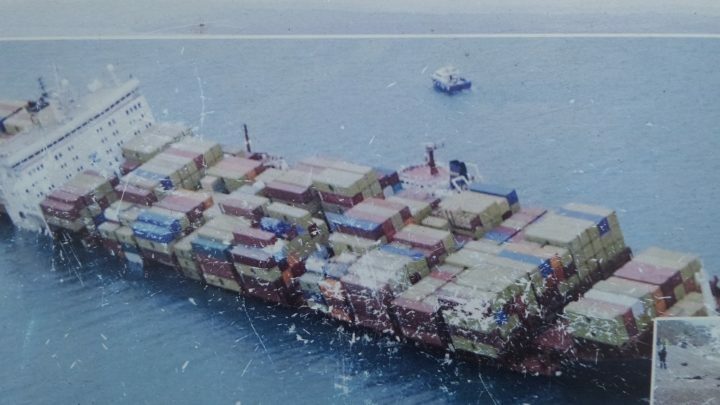 Treasure hunters descended there when hundreds of containers were washed ashore. For two days it was an all-in looting fest! Today a giant anchor and plaque is all that is left after the long salvage operation. When you visit the Jurassic Coast in East Devon, allow plenty of time to cruise up and down this extraordinary region of England. Not only are there a string of engaging activities along the coastline, there are also many attractions in the general region. One of them is the ancient town of Honiton. It is the spiritual home of Honiton Lace and enjoys a world-wide reputation for this delicate and tedious craft. If you are driving, a reminder that many roads in this region are very narrow. We found this out when we lost our drivers side wing mirror after clashing with a passing car. Devon’s Jurassic Coast is a ‘must see’. Have you had an adventure along Devon’s Jurassic Coast in the United Kingdom? Do you like to self-drive when you are on holidays?